The Beatles have been taken on by everyone from the Feelies to a bunch of dogs, each adding their own slant to things, so why do I dig this particular record so much? Well, honestly, this quartet from Nebraska in 1980 actually were trying to make the Beatles' music sound better. However you judge in terms of improvement, the attempt was done in a pure spirited way with a set of basic electronic elements, vocals, bass and drums, managing to project a sense of lofty artistic and definite postmodern design, but without pretentiousness. Because of the cold/synthy approach here, a lot of people already lump the Better Beatles in with a similar ideology the Residents took to their cover targets (Hank Williams, James Brown, Stones, etc. ), but I think the Eyeballed Ones were a bit more mastered in the art of media manipulation and the connotations attached to pros like themselves taking on pop culture. 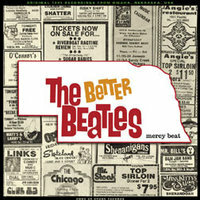 The Better Beatles, again, just really seemed to really just have vibed on attacking the songs with the vocabulary they had inherent within themselves. Add that in with the fact that in Middle America circa 1980, the Fab Four's indelible etch upon pop consumer consciousness (even for kids who weren't around during their heyday) seemed a logical monolith to chuck in start to mount. Only having officially put out one 7" single, Hook or Crook has just raided the complete tape vault and issued a full LP, featuring an informative bio and modern-day interview with Jay Hinman. Thanks to the label for letting us give you all a sampling here on BOHA. 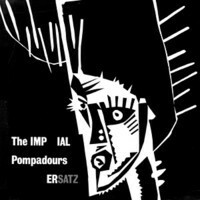 am extremely thrilled to have caught the posting of the 1982 record Ersatz by the one and only Imperial Pompadours. Reviewed on Julian Cope's site back in 2000, this zero-budget, acid-punk thing of beauty was birthed by Barney Bubbles best known for creating assorted Stiff label and Hawkwind sleeves. In fact, Hawkwind's Robert Calvert and Nik Turner join him in this insane session, comprised of Nuggets-style covers (see the Novas' "Do the Crusher" MP3 above) all quickly recorded and augmented with pots and pans percussion, messed up electronics and ridiculous vocal performances. 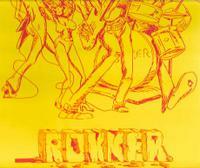 The record's musicians are all anonymous on the sleeve, with a Novas-style "Play It Loud You Turkeynecks" stamped on the back. The 24 minute finale "Insolence Across the Nation" drifts for its first half through strange collage soundscapes then delves into a lost mind mode right up there with Patty Waters' "Black Is the Color of My True Love's Hair"; it seems to be one of these guys reciting his life in Hitler's shoes. Completely wacked, and the whole album file is up here. This version of "The Crusher" is remarkable in that it may be the first time that any music has actually produced a feeling of physical discomfort in the non-metaphorical sense. I had to stop listening because the vocal 'performance' triggered some sort of sympathetic vomit reflex in my stomach. I thought the Better Beatles were awe-inspiring, but "The Crusher" made me laugh so much my stomach hurt. It is calling out to be played on Dr. Demento. Well after hearing the Imperial Pompadours I gotta say I agree with D.W. It's a shame that Rob Calvert lost his marbles and all but that stuff was just gross. Thank u, it's look like the reason I bring a jump drive to work. There to many mp3 stores. Which is right ? what the hell is a jump drive? For the record, this album is largely performed by members of Inner City Unit (Nik Turner, Dead Fred, Trev Thoms, etc) all of whom share vocal duties, and of course the late great Robert Calvert. Barney Bubbles was the mastermind behind it, and side one consists of tracks he played to assembled musos once, instructing them to recreate the songs from memory. Barney produced this half of the album, whereas side two was produced by Nik Turner at his Cadillac Ranch in Wales, and as stated is nothing less than a bizarre journey through the life of Adolf Hitler, with much Wagnerian sampling/theft. It's certainly an album that divides opinion, but having had an original vinyl copy since the 80s I fell under its spell many years ago. "Light show! Light show! Light show!"